The Pan and Slam Essentials are intended to highlight great personal favorite films and underrated classics. Bringing Out the Dead is both of these. A forgotten gem of a picture that remains a buried treasure directed by one of the most prolific filmmakers of all time, Martin Scorsese. 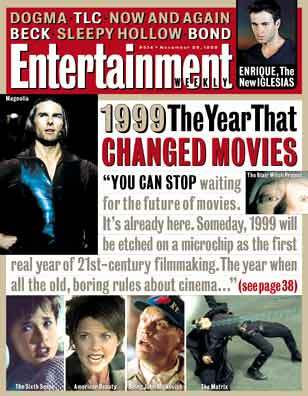 1999 was one of the most exciting years for motion pictures during my lifetime. With an output as diverse as any in recent memory, it included pictures that combined intelligence with escapism that influenced and redefined entire genres. The Matrix, The Blair Witch Project, American Pie, Star Wars Episode I: The Phantom Menace, South Park: Bigger, Longer and Uncut, The Iron Giant, Being John Malkovich, Magnolia, Boys Don’t Cry, Topsy-Turvy and Kubrick’s final opus Eyes Wide Shut were all released that year. Some highly subversive and some remarkably sincere, even the film’s I disliked were still interesting failures such as Fight Club, The Insider and The Sixth Sense. American Beauty would win best picture that year and despite losing some of its credibility as time has passed I still think it is an excellent film. Needless to say 1999 was a crowded year for movies and there were bound to be some lost in the shuffle especially at the end of the year with an awards season where there were so many pictures and actors worthy of Oscars. In the 1990’s Scorsese was not as well respected as he is today. Most people saw Taxi Driver and Raging Bull as his only great films and his output during the 80’s and 90’s were not as well regarded as they are today. 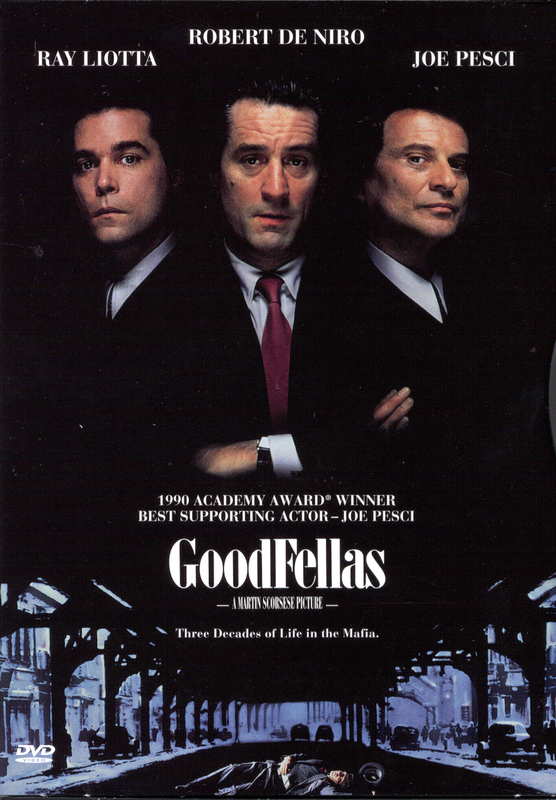 In fact even Goodfellas was marginalized during this time. Brining Out the Dead is often considered the nadir of Scorsese’s career. He was following up Kundun, a film with no stars about the Dalai Lama that made no money, with a film packed with star power that would also make very little in ticket sales. Big name actors lined up for this film and none were bigger than it’s leading man Nicolas Cage when he was still a respected Academy Award winning leading man and not a joke that wears bear suits and punches women. 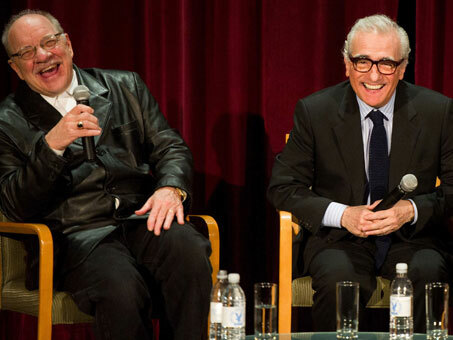 It reunited Martin Scorsese with Paul Schrader, who also wrote Taxi Driver. The comparisons are inevitable and Bringing Out the Dead is inferior to Taxi Driver, but almost everything is. They both take place in New York City at its darkest and grittiest in the pre-Giuliani era. Both involve an antihero lost in his life, confused and sickened by the world around him, and looking for love in all the wrong ways. Bringing Out the Dead is a fiery and visceral movie. Scorsese’s direction is as energetic as always, just like his most recent output The Wolf of Wall Street. 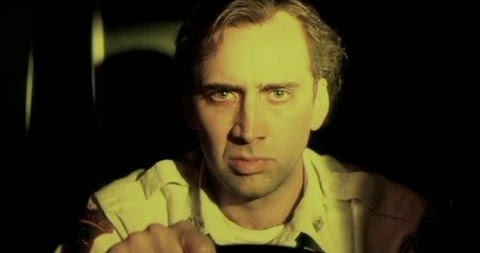 Nicolas Cage gives an inspired performance worthy of a Best Actor Academy Award nomination as Frank the ambulance driver and paramedic who has worked the graveyard shift too long and feels he is cursed. He feels he loses too many lives on the job and is haunted by the ghosts of patients he saw die over the years. The supporting cast is stellar as well especially his rotating partners played by John Goodman, Ving Rhames and an extremely unpredictable Tom Sizemore. The editing is kinetic and keeps the pace as fast as the ambulances are driving on the screen. The soundtrack of classic rock and modern rock hits is reminiscent of Goodfellas and Casino once again comparing this film to those it is inferior, but once again so are most movies that have been made other than Citizen Kane. This is about a man lost in the world around him, trying to find something worth living for, something good in this filth and decay that surrounds him. Cliff Curtis is superb as the drug dealer who offers our hero peace and solace with his product even though they both know its dangers. 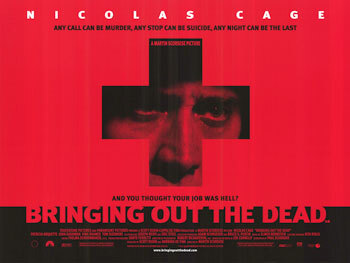 Patricia Arquette plays the girl whose father is dying in the hospital that Cage tries to save. She becomes the object of his affection to do something right for at least one person in this city. It is a study about how stresses of a job can bring a once good man to the brink of madness. 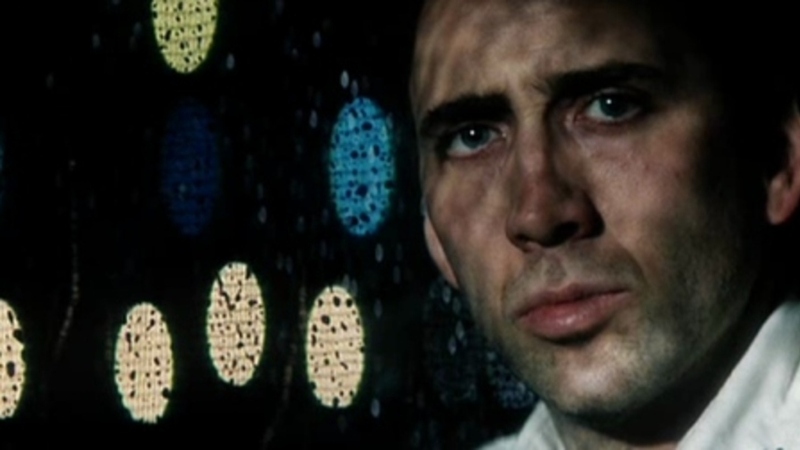 Cage gives a great performance of instability and loneliness filled with desperation to feel a positive human connection. Brining Out the Dead is a simultaneously beautiful and ugly film about the ghosts we deal with in our past and how our past mistakes and regrets can drive us over the edge if we do not take care of ourselves mentally and emotionally. This movie, like Taxi Driver is Scorsese at his most relentless and passionate. It is an uncensored look at a man dealing with moral, ethical and religious questions, all of which are themes that run through every Scorsese film. In no way was he trying to sell out or make a “hit” film despite having a cast of household names and an upbeat soundtrack. Bringing Out the Dead marks the end of an era for Scorsese. His next movie, Gangs of New York in 2002, would commence the beginning of a very rewarding partnership with the director and actor Leonardo DiCaprio, as well as a fruitful relationship with the Academy Awards. 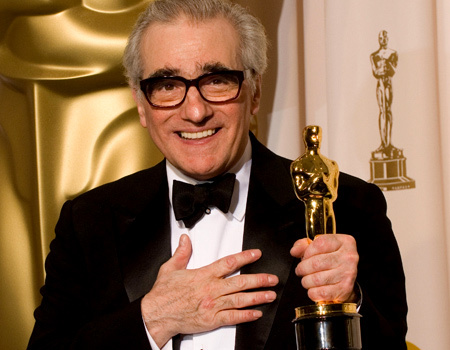 After Bringing Out the Dead, four of his next five films would earn best picture and best director nominations for Scorsese (Shutter Island being the only one that would not, however it would be very lucrative at the box office). 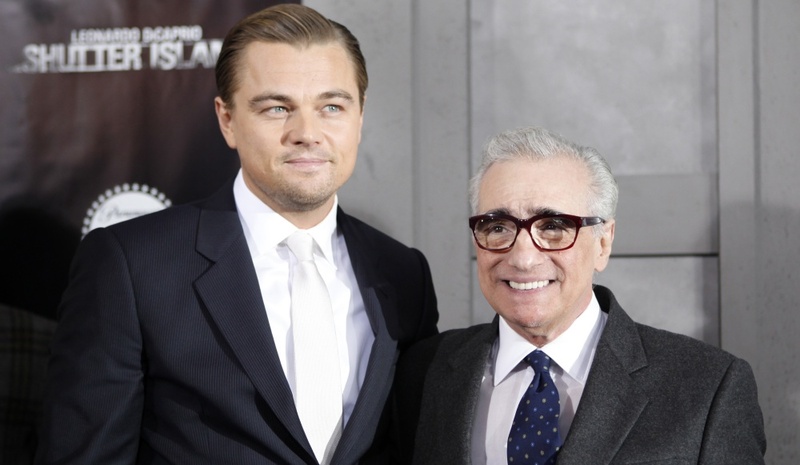 Scorsese would experience a renaissance with DiCaprio as his new muse once the twenty first century began and his days of struggling to make his visions reach the masses would seem like a distant memory. This is probably why Bringing Out the Dead remains a forgotten gem. It comes from a time that no longer exists. Scorsese is still making passionate and provocative films but instead of being met with tepid responses from audiences and award shows, they are embraced and he has become one of the most beloved filmmakers of the past decade. It is indeed nice to see the man receive the honors and admiration he adeserved his entire career but we should not forget the films that failed to connect with the mainstream because they had the same passion of his successes and drove him to make the films we have from him today.